Of course, that doesn’t stop me from thinking: now that it’s awful and dark and rainy out, maybe the iPhone camera will be able to create some magic in the kitchen. 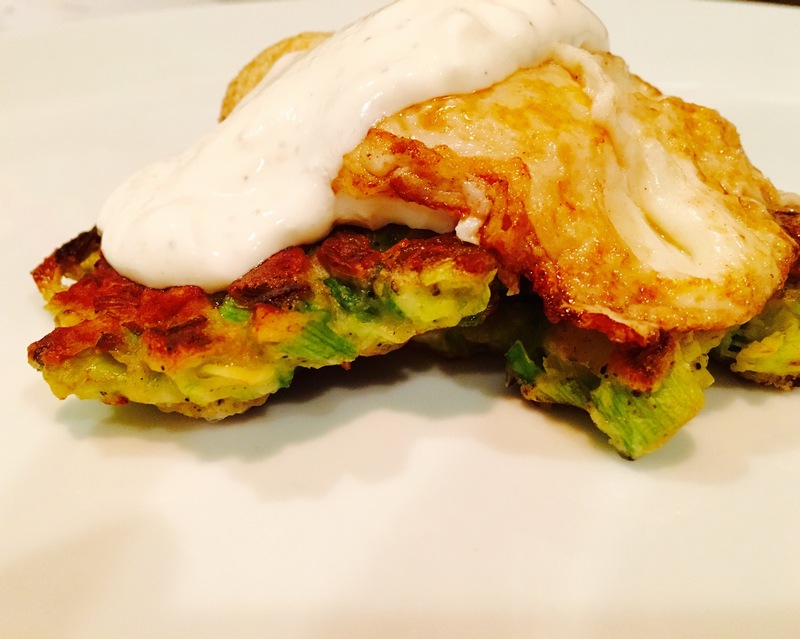 First up, these leek fritters, taken unabashedly from the Smitten Kitchen, in honor of Rosh Hashanah. Yes, I know that latkes are for Hanukkah and moreover, that they’re made with potatoes. But who wouldn’t want to start the New Year, though, with some fried onions with cream and garlic? **tip: if you’re serving these for dinner, this makes a comfortable amount for 2 people for dinner. Otherwise, double the recipe if you’re serving 4, etc. Prep your vegetables. Trim the leeks, leaving the white and pale green parts. Cut them lengthwise and slice them thinly crosswise. Slice up the scallions, discarding the bottom parts. Bring a pot of salted water to boil, and boil the leeks for about 3-4 minutes. Drain, and then wring all the water out using a dish towel, paper towel, or cheese cloth. Try to get out as much water as you can. Mix the leeks and the scallions in a large bowl with your fingers, making sure to break up the clumps of leeks that will form after you wring them out. In a separate bowl, mix together the flour, baking powder, salt, pepper, crushed red pepper and garlic powder. Add to the leeks/scallions, and then add one egg. Give it all a stir so a lumpy batter forms. Preheat an oven and a baking sheet so you can keep your batches of leeks warm. Over medium to medium-low heat, heat more butter than you think your heart wants, and then add little drops of batter to the pan, smushing each little drop so it forms a flat pancake. Fry each side until golden brown, about 2-3 minutes per side. When nice and toasty, transfer to the warmed oven. Repeat until you finish off the batter. While your fritters cook, mix together your cream sauce by adding the sour cream, garlic, lemon, lemon zest, salt, pepper and hot sauce together and whisking. When the last of your fritters is sitting in the oven, fry up a couple of eggs to finish off your meal. Serve hot. Deb Perelman promises that these keep well in the fridge for a week, or in the freezer for about a month – simply warm them up in a 325 degree oven to get them nice and crisp again. The Husband and I have no idea if this is true, because we gobbled all of these right up. When the Husband and I were forced to move from our last apartment, we decided to make a big leap and move a whole one and a half blocks down, on the same street. We are nothing if not adventurous. Surprisingly, even this small change of scenery meant we noticed things we had never registered before. For example, the Indian/Pakistani takeout place in the basement next door. It even had an amazing name, involving the word “sacrificial.” Um, OK. Because the first thing either one of us suggests when we get home from a trip is Indian food, we’re in. Sadly, Sacrificial didn’t live up to our (mental) hype. So when we don’t want to walk the whole five blocks to our normal Indian place (hey, DC is HOT in the summer! ), we have to make our own. 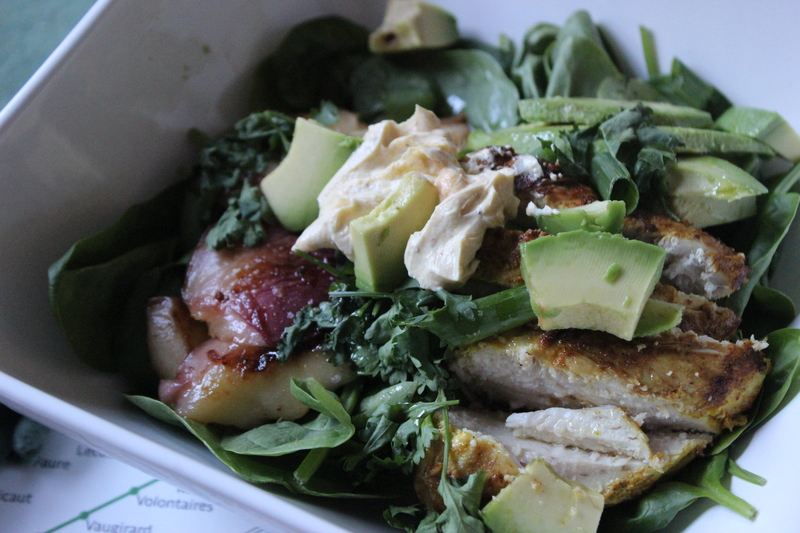 Fortunately, this dish is so easy no one feels like they’ve sacrificed anything. Recipe adapted from Real Simple. In a small bowl, mix the yogurt, curry powder, hot sauce and garlic. Set a little bit aside, for use as your sauce later. Stick the rest of the mixture in a ziplock bag, put your chicken breasts in there, and make sure they’re coated thoroughly. Go off on your merry/to work ways, and let marinate for about 8 hours. Heat a grill or grill pan to medium & coat with a little cooking spray. 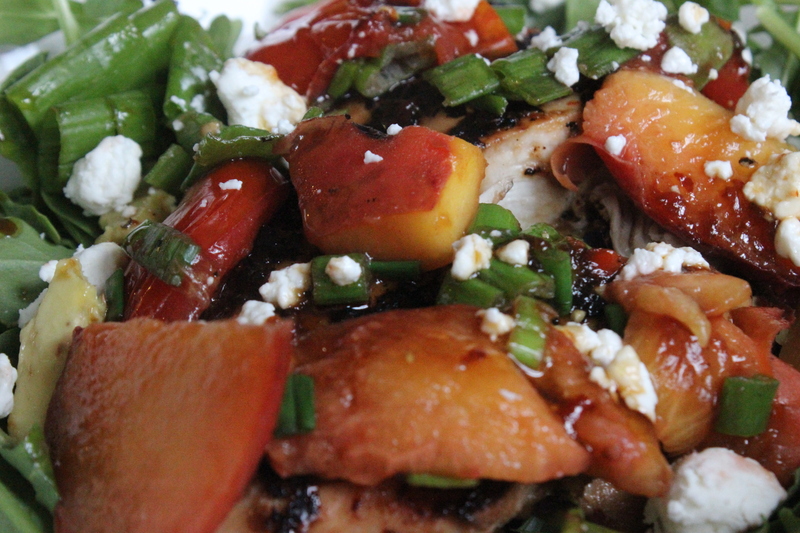 Toss the sliced peaches with a little salt, pepper and olive oil; grill those about 3-4 minutes. For the last minute or two, add your scallions. Set aside and keep warm (I wrapped mine in aluminum). Remove the chicken from its marinade and add to to the grill, cooking about 4-5 minutes per side, or until done. 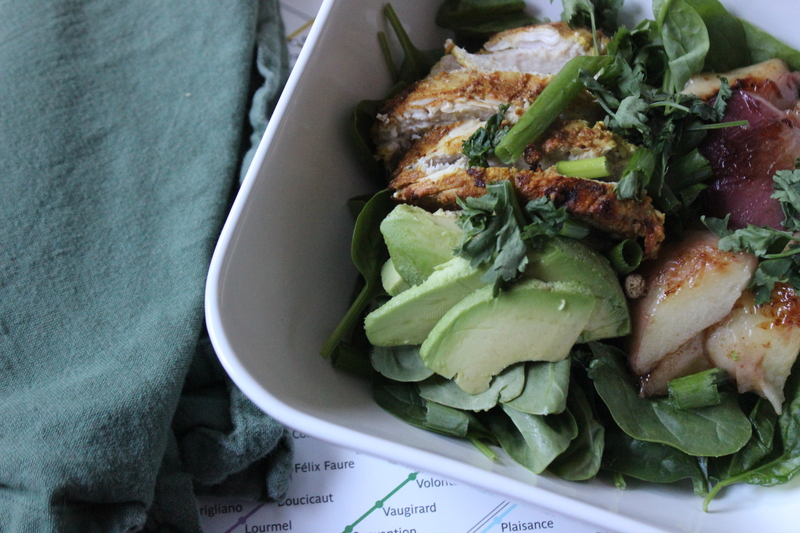 Assemble your salad: arugula, avocado, chicken, peaches, & scallions. Top with a little bit of reserved sauce. 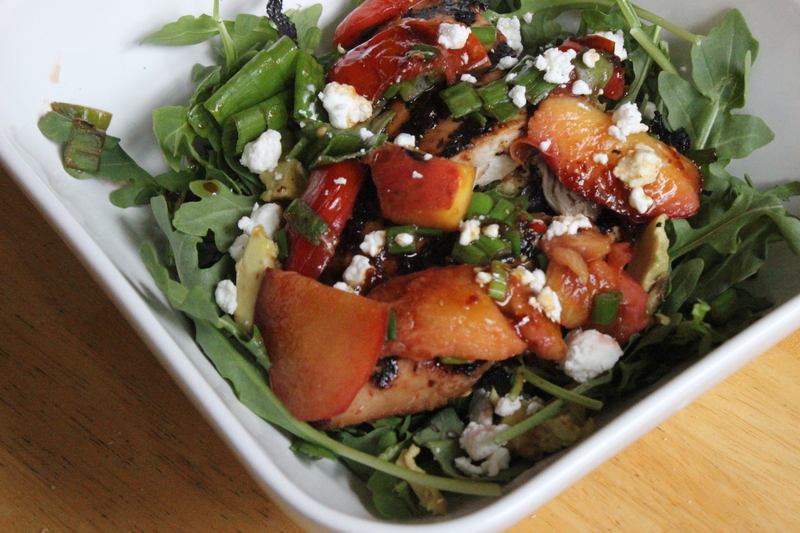 I like to make a grilled peach, chicken and goat cheese salad that’s become a staple around here on those summer nights that we realize that we’ve eaten mostly ice cream, chocolate covered pretzels, and/or cheeseburgers. This is a nice little update that delivers those same healthy-reset vibes, so you can get back to eating ice cream, chocolate covered pretzels, and/or cheeseburgers.